Read An Interview with Geroge Merrill of Merrill-Williams Audio, by Ray Seda. Back in 1973, my passion for turntables began with a modest purchase of an Acoustic Research AR XA. At something like $88 including a pre-installed Shure cartridge, it was a no-brainer even for a High School freshman on a paper route budget. For several years, I “unofficially” worked at an audio store, assembling and setting them up for waiting customers. Little did I know back then that this cheap unassuming little workhorse of a turntable and diamond in the rough would ignite the creative juices of one George Merrill in Tennessee. In the 1970’s, George Merrill was owner/operator of an audio salon in Memphis, Tennessee called Underground Sound. His interest in turntable design, particularly in the area of energy management and isolation, led to execution and design of a very successful series of purpose-driven and effective upgrades for the legacy AR turntables. The AR was a belt-driven turntable sporting a 2-piece platter, fixed AC synchronous motor, and a spring suspended aluminum T-bar sub chassis. Since the AR was arguably the most prolific turntable in the audiophile community, with a user base of tens of thousands, these Merrill upgrades were very well-received and sold in the thousands to these same passionate AR turntable enthusiasts. 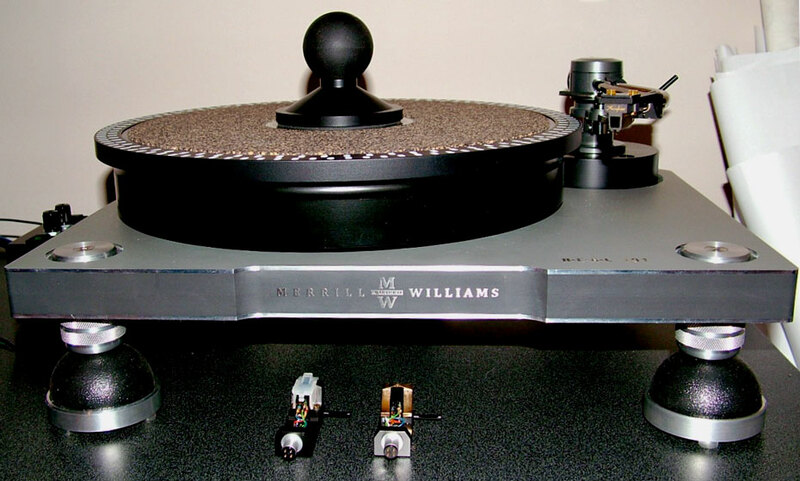 The AR turntable proved to be a financial boon and a worthy test bed for Mr. Merrill. The experience and knowledge gained from the AR turntable-upgrade business led to the development and creation of a turntable of his own design in 1978, called the Merrill Heirloom. The thrust of George Merrill’s work centered upon the control and elimination of mechanical energy and vibration. True to the AR formula, the heirloom sported a spring T-bar subchassis suspension and was belt driven with an AC synchronous motor. However, this is where the similarities ended. The choice of materials used in the Heirloom were a series of firsts, including extensive use of acrylics and plastics for the system’s major components, such as platter, motor pulley, and suspended sub chassis. My earliest recollection of a commercially available turntable other than the Heirloom to even sport a plastic platter was the similarly suspended belt-drive of British origins from the early 1980’s, the Pink Triangle. Of course in today’s world, extensive use of polycarbonate, acrylics, and other plastics is more the norm than the exception when it comes to turntable design. One needs look no further than the Clearaudio or VPI products to confirm this. Much has been written in the past about George Merrill’s influence on modern turntable design. His products have always been met with critical and commercial success and have earned him a solid chapter in the history and evolution of our Audiophile hobby. However, Mr. Merrill’s efforts in vinyl playback do not end with turntables. He has engineered quite a few accessory items that also support the process including a record cleaner, a deep cleaning apparatus, record lubricant to facilitate low noise and accurate playback, lead and cork platter mats, etc. The list seems endless. You will read about some of these in the future as I begin to fully explore these items. George Merrill’s latest endeavor together with new design partner, Robert Williams, is the Merrill-Williams R.E.A.L. 101, the subject of this review. The Merrill Williams R.E.A.L. 101 drew my interest long before I actually had a chance to hear it at AXPONA 2011. The very comprehensive Merrill Williams website that is dedicated to the full explanation of the R.E.A.L. 101 concept reveals much of what makes this turntable tick. As a rabid turntable, tonearm, and cartridge junkie, I was immediately fascinated by the fact that this turntable, for all intents and purposes, is predominantly made of rubber! Certainly my mind could not wrap itself around that fact. As I delved deeper into the Merrill Williams literature, it describes the precision machining of the elastomeric plinth into energy isolation valleys. Machining? How do you machine rubber? Well, as it turns out, the specialized elastomer compound, fourteen pounds of it, utilized for the plinth is indeed hard and stable enough to be precision machined. Seeing and hearing the turntable in action in an all-Quad system at AXPONA, pretty well sealed the deal. It was very fortunate for me that George Merrill had already graciously agreed to a review and I was quite excited with the prospect of having the R.E.A.L 101 delivered to my home ASAP. George Merrill mantiene ancora un inventario di tali motori, nonché di altre parti per sostenere i suoi giradischi più anziani. Prega di contattare direttamente il Sig. Merrill e sono sicuro che sarà in grado di aiutarvi con le vostre esigenze.